Every Friday night is movie + pizza night at chez TLFB. It started when our girl was about 4, she’s 11 now so it is well and truly engrained in our weekly routine. I started it as a way of doing something together as a family to celebrate the end of the school and working week. And I’m so glad I did, we all look forward to it every week and it really is a great way to switch off from the stresses of the week. So movie night also involves pizza, and I usually make our own but some weeks are busier than others and I don’t always have time to make our own pizzas. On days like that I make this artichoke and spinach flatbread pizza. These flatbread pizzas are a little bit of a cheat, you buy the flatbread and then assemble the pizza. No kneading dough, no waiting for a rise. These pizzas are easy peasy, lemon squeezy. And you know what? I think it’s ok to cheat a little bit in the kitchen, sometimes. I mean life gets busy right, and sometimes it’s hard to feel motivated to do the whole home made thing. Little cheats or short cuts in the kitchen now and then can make your life easier just when you need it. And I firmly believe that we should not feel guilty for using little short cuts. Once everyone gets a decent meal then mission accomplished. Sometimes spending more time with your family than in the kitchen is more important. So this is a really quick recipe, you just need to buy yourself some flatbread and go crazy with the toppings. We love artichoke pizza so for this one I’ve upped the ante and added spinach, courgette and lemon to lift all those flavours. I added crumbled feta and chilli flakes at the end to really up the flavour and then top the whole thing off with toasted pine nuts and basil. The toasted pine nuts add a little earthiness to the pizza. As always you may want to hold the chilli flakes for the kids. You could swap the flatbread for store bought pizza bases or you could of course make your own bases. These artichoke flatbreads are not just great for when you are mega bust but they are really tasty, proper comfort food for Friday nights. They are also great if you have surprise visitors or an unexpected play date. Kids love these and 2 of these bad boys will feed about 6 kids or 4 adults, serve them up with a green salad and happy days. 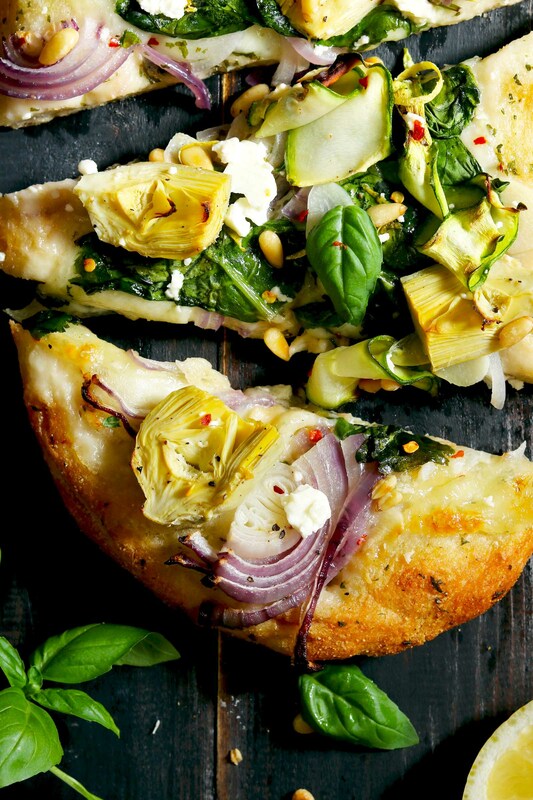 An easy artichoke and spinach flatbread pizza stacked with veggies and a hint of lemon. Perfect for busy evenings when you really don't want to cook. Pre heat the oven to 200 degrees C / 392 F, I use an electric, fan assisted oven please adjust according to your own oven. Place the flatbreads on two baking trays, then place the mozzarella on the flatbreads. Top with garlic, spinach, red onion, courgette and artichoke. Add the lemon zest, salt and black pepper then drizzle over the oil. Bake in the oven for 20 to 25 minutes, until the cheese is bubbling and golden brown. Remove from the oven then top with the crumbled feta, pine nuts, basil leaves and chilli flakes. Add a squeeze of lemon and more cracked black pepper to serve. This is a beautiful looking pizza. I love adding artichoke on a pizza, as it gives it such a meaty texture. I’m all for tradition to make evenings in fun and something to look forward to. This pizza a a great cheat for when the week is just too busy to contemplate pizza from scratch – far better than take out. This is a great way to use more artichokes in our meals. It looks beautiful! This looks delicious. When I was growing up Saturday night was pizza night. I wish I could say our creations were as exciting as this but it was always store bought bases, tomato puree, cheddar cheese and some pepperoni! How things change! There is no way I could ever resist this! Call it flatbread, call it pizza, just call it delicious!! We are having pizza tonight but it won’t look like this. This sounds and looks amazing. Loving the added pine nuts! What an elegant flatbread Michelle. It’s the perfect little pizza for spring. And you gotta love how quick and easy it is to get something so beautiful on the table.